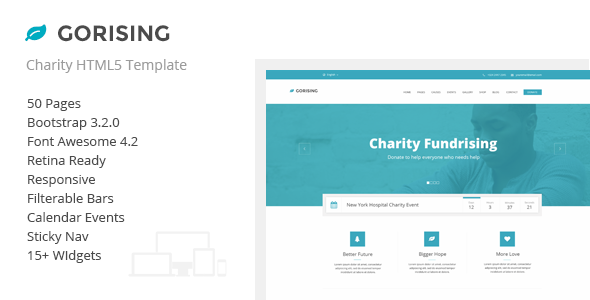 Gorising v1.0 – HTML template is charity template with great looking, super clean design and awesome functionality. It is fully responsive and retina ready. Bootstrap v3.2.0 based and it comes in with 50 HTML5/CSS3 pages in package. Useful separated stylesheets so you can change main color or overall layout easily. All in all Gorising HTML template is unique charity template which provide really wide range of possibilities for customization. This entry was posted in charity, nonprofit, site-templates and tagged charity, charity donate, charity shop, clean, donate, fundrising, modern, nonprofit by Acty. Bookmark the permalink.